Getting into Scratch Building - 20+ Planes with ONE Motor & ONE Power Pod! This is What My NutBall Can Do! I use a Triton 2 EQ 100W balance charger (http://www3.towerhobbies.com/cgi-bin/wti0001p?&I=LXVZA8&P=ML [Note: I don’t really recommend this charger, I just bought it before I knew much about chargers. This thing is ridiculously expensive for what it does and has some silly quirks, occasional bugs, and outdated firmware]) to regularly charge up to 8 2S 500-1000 mAh packs simultaneously, all in just over 1 hour! I also regularly charge 3S LiPos and micro 1S Lipos (I’ve done up to 14 of those at once) simultaneously using that one, single-port charger. This is called parallel charging. Essentially, parallel charging allows you to plug in many batteries at once, into one port in a single charger, and, if your charger is powerful enough, charge them all in ~1 hour or less. All at once—boom, done! No more messing around buying many chargers or setting up the charger many times to charge multiple batteries. I use this charge board (shown above) plus a couple other parallel adapters I plug into it. If you use Deans connectors, use this board instead. The board by itself is designed for only up to 6 batteries at once, so I added a couple parallel harnesses to get 8. However, YOU MUST KNOW WHAT YOU ARE DOING OR PARALLEL CHARGING IS DANGEROUS. For example, if you plug a 2S battery in with a 3S battery, the 2S battery will be destroyed and catch fire if you leave it there. One thing that annoys me very much about virtually all local hobby shops is that as of today, 22 Jan 2013, I haven’t found a single one that uses parallel charging or sells parallel charging equipment yet, and yet I’ve been into about 12 local shops in the past few years and looked specifically for parallel charge equipment. This charging technique has been around for probably 6 years, and is very effective and safe when done right, so I have to assume that most local hobby shops are either A) completely oblivious about parallel charging, B) do not want to promote it because it is better for them to sell another charger rather than a parallel charge board (ie: they’ll make more money selling another charger), or C) they secretly use this technique at home but simply don’t want to be responsible for user error if a customer destroys their equipment or property if they don’t know what they’re doing while attempting it. UPDATE (21 July 2015): I have found a hobby shop that now has parallel charging equipment! It is Radical RC. (They've had them for a couple years now, I just haven't updated this article until now). Way to go Radical RC! Despite this, I am a strong proponent of parallel charging and have used it nearly every charge I’ve ever done since I discovered it in the early part of 2011. I am always recommending to people that they use parallel charging, as it allows any single port LiPo charger to charge many batteries at once instead of just one battery at once. With the right harness, even a cheap $5 2-3S LiPo charger can do parallel charging! (However, this is less useful since these low-power chargers don’t have enough power to maintain a 1C charge rate anyway). So, let’s get started. First off, parallel charging can be done with LiPo, LiFe, or Li-Ion batteries ONLY. Do NOT attempt to use this technique with NiCad/NiMH batteries, etc., as they use a peak voltage (ΔV) detection charge technique rather than a constant current/constant voltage (CC/CV) charge technique. A battery chemistry capable of being charged via the CC/CV technique is a must for parallel charging to be safe and effective. 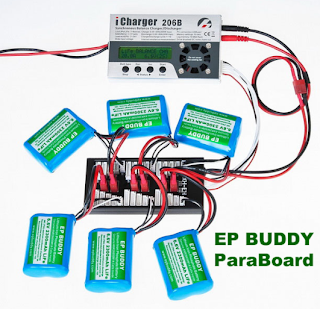 Parallel charging means that you plug many LiPo batteries into each other via a special board or harness so that all of their negative leads are connected to each other, and all of their positive leads are connected to each other. Now, the entire battery packs are in parallel. In order to balance the cells with your charger, however, the balance wires of all of the batteries must also all be connected in order to put the individual cells in parallel with each other. WARNING: YOU CAN ONLY PARALLEL CHARGE BATTERIES OF THE SAME CELL COUNT (or the lower cell count battery will catch fire), AND SIMILAR STATE OF CHARGE (or damage to the lesser-charged battery will occur). When many batteries are connected in parallel, the charger “sees” all of them as a single, large battery, with a capacity equivalent to the sum of their individual capacities. But what about cell balance—how does parallel charging really work? In nature, whenever a gradient exists, a natural balancing process will occur. A gradient means that there is a high concentration of something as compared to a low concentration of that same thing near it. For example, if you pour salt into still water, the area of water where the salt is will become very salty. The rest of the water lacks salt, so this “salt gradient” will naturally cause the high concentration of salt to balance out, or diffuse, into the water with a low concentration of salt. The same occurs with heat. Heat will naturally diffuse from a hot area into a cold area, attempting to find a balance. If the hot area always remains hotter than the colder area, it is not because the heat isn’t diffusing, but rather it is because a heat source exists at the hot spot, and there is a resistance to the heat flow preventing it from fully diffusing. Pressure also follows this natural balancing process. Take a blown up balloon, for example, and untie it. There is a large pressure difference (or gradient) between the air in the balloon, and the air in the room. The high-pressure air in the balloon will rush out into the lower-pressure air in the room, diffusing the high pressure into the lower pressure until an equilibrium pressure is achieved. Electricity also follows this principle of diffusion. The battery with the higher voltage will naturally push its charge (electrons) into the batteries with lower voltage, when plugged in parallel, until all batteries equalize to the same voltage. Since the individual cells of each battery are also in parallel with the individual cells of all the rest of the batteries, when the balance leads are connected in parallel (by plugging them all into a parallel charge board), all of the strings of cells in parallel will also equalize to the same voltage. Now, when you plug the entire parallel charge board balance lead into your charger, your charger will balance out the cells of each battery as if it was simply one large battery. The charger will "see" the first string of cells in parallel as a single "Cell 1," and the second string of cells in parallel as a single "Cell 2," and the third string of cells in parallel as a single "Cell 3," etc., balancing them as if they were individual cells of a larger capacity battery! The result is that in parallel charging, all cells come out properly balanced so long as the cells are not damaged, your charger is functioning properly, you plugged them all in properly, and nothing else is wrong! This entire article is written for those of you using raw, unprotected parallel charge boards with NO fuses or current protection circuits of any kind. If anyone tells you that you *must* have protection power fuses and polyfuses and things on your board, they are flat out wrong. I don't own such a board. I still use the raw, unprotected boards. IF YOU FOLLOW MY PROCEDURES THIS IS PERFECTLY FINE AND SAFE. If you make a mistake, however, a fuse-protected board could prevent a battery mishap, so feel free to buy protected boards. IN THE PAST FEW YEARS, as parallel charging has become more widespread, companies selling parallel charge equipment have added things such as large power fuses to the main leads, and small polyfuses (self-resetting, automatic fuses), to the balance leads. You can recognize these well-protected and more advanced boards usually by their price tag. They are oftentimes very expensive! (Think: "I could buy another cheap smart charger, or I could buy a parallel charge board" kind of expensive). If you are foolish or inattentive and plug a fully-charged battery into an empty battery, for instance, the main fuse will blow. You'll have to replace it. It may be an automotive-type fuse you can buy at an auto parts store. If you make this mistake on an unprotected board, this large current may damage the main leads, blow the large traces in the parallel charge board, and damage the lower-charged battery, causing it to puff up or even catch fire. Note: the main fuse requires a *lot* of current to blow usually, so, you better still follow my guidelines below to keep you and your batteries safe. If the batteries are too far out of balance, or if you plug the balance leads in parallel first, before the main leads, an unsafe surge might go through the balance leads. A polyfused parallel charge board will automatically limit this current flow through the balance leads, preventing any problems. The polyfuses will simply close off (passively, but automatically increasing their resistance) to limit the current flow. If you make this mistake on an unprotected board, this large current may heat up and melt, damage, or blow the balance leads, blow the balance traces in the parallel charge board (I've done this by touching the balance leads to the balance board backwards, in reverse polarity, for instance), or cause a high enough current to the lower-charged battery to damage it. The same goes for reverse-polarity protection: a protected board may protect against this mistake. An unprotected board.....could cause the same problems as above. You might experience damage to the leads, blowing traces in the board, batteries on fire (if the reverse-polarity contact is prolonged), spark-welding of plugs together, etc. Summary of the above: I like the raw, unprotected boards. They work well for me. They are very inexpensive. They are easy to find, and parallel charge harnesses can be easily hand-made if desired. If you follow my rules below, unprotected boards work fine. If you are prone to errors or want extra protection, consider buying the protected boards with things like main lead fuses, balance lead polyfuses, and reverse-polarity protection. ONLY USE LIPO/LIFE/LI-ION BATTERIES WITH THE SAME CELL COUNT, ***NO*** EXCEPTIONS. Ex: 2S with 2S, 3S with 3S, etc. ONLY PARALLEL CHARGE BATTERIES OF THE SAME LITHIUM CHEMISTRY TYPE TOGETHER. Ex: LiPo with LiPo, LiFe with LiFe, Li-Ion with Li-Ion, but NOT LiPo with LiFe, LiPo with Li-Ion, etc. Preferably, use batteries of similar capacities. Ex: 500~1500 mah batteries together, or 1000~2200 mah batteries together, but not a 500 mah battery with a 10,000 mah battery. Use batteries with similar states of charge (how much they are charged/discharged). Ex: do NOT put a 1/2 full or 3/4 full battery in parallel with an empty battery. All batteries must be at similar discharge state. SEE PLOTS BELOW FOR MORE INFORMATION. Use batteries of similar ages. Ex: it is not as advisable to put a new battery with a 2 year old battery, but not critical as long as the batteries are similar capacities (mAh ratings), the same cell count, and at similar discharge states. Always plug in the *main* plug first on ALL batteries, *then* plug in all the balance plugs. Also, it is good to *wait several minutes* AFTER plugging in the main battery leads into the parallel charge board BEFORE plugging in the balance plugs. This prevents high currents from flowing through the balance plugs as the batteries equalize based on their varying voltages upon plugging them in. The main plugs can take more current. This is also the reason you want to use batteries of similar states of charge/discharge. Fuse-protected parallel charge board note: this rule of plugging in the main leads, waiting a while, *then* plugging in the balance leads always works if you also follow all of the rest of my advice, *even with fuse-protected boards. * However, people have told me that some polyfuse-protected parallel charge boards recommend you plug in the *balance* leads first, wait a while, *then* plug in the main leads. Why? Well, it seems logical to me that this is because the balance leads are polyfuse protected. Since the balance leads have polyfuses, they act as automatic current limiters to let the charge between the LiPos more slowly balance out. The main leads require too much current to be easily polyfuse-protected, however, so the balance leads are probably the ones with the current-limiting polyfuses. So...if your particular "protected board" recommends this "reversed plug-in order," that's ok. You may choose to follow their advice, depending on how well-designed their board is, or you can just follow my standard advice and order. I like to just stick to all of my standard rules here, because I know they always work, for all boards, whether fuse-protected or not, all of the time. Once all batteries are plugged in together in parallel, wait several minutes (3~10 minutes or so) for them to equalize their voltages. 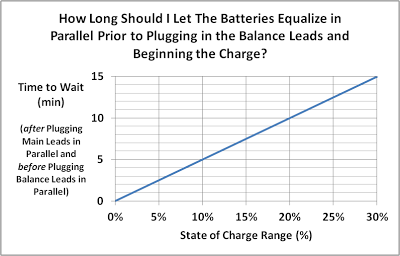 The farther apart the batteries' charge states, the longer you should wait. See plots below. To determine the charge rate when charging in parallel (assuming the standard 1C charge rate), ADD all of the battery capacities together, then use that value as the charge current. Ex: parallel charging three 3S 1300 mAh (1.3Ah) LiPo's with two 3S 1000 mAh (1Ah) Lipo's would mean that you should set your charger on the 3 cell LiPo setting at a charge rate of (3 x 1.3) + (2 x 1) = 5.9A. Therefore, in this scenario, a charge rate of 5.9A corresponds to a 1C charge rate, and the charger will consider all of those batteries in parallel to be a *single* 5900 mAh (5.9Ah) 3S Lipo. It is recommended to use a fire-proof LiPo-Safe Charge bag when charging, such as this one here. I like to place the entire charge board with all of the attached batteries, if possible, inside of the same charge bag. If the batteries are very large, and this is not possible, feel free to separate the batteries into separate charge bags. Note: charge bags have a special slit in the side, near the velcro, to allow the cables to come out of the bag, so placing the entire charge board, or individual attached batteries, into a charge bag is not a problem. Feel free to Google for more info on "parallel charging" of LiPo packs. Again: this method is NOT recommended for NiMh or NiCad cells, as it may cause them to catch fire, though for LiPos it works great! I recommend HobbyKing (www.hobbyking.com), ProgressiveRC (http://www.progressiverc.com/), or BuddyRC (www.buddyrc.com). Parallel charging all these batteries at once with only 3 chargers! AS LONG AS THE BATTERIES ARE WITHIN ~25% (OR LESS) STATE OF CHARGE OF EACH OTHER, THEY MAY BE PARALLEL-CHARGED TOGETHER. If they are more than ~25% apart, the higher-charged battery will push a current into the lower-charged battery equal to or greater than a 1~2C charge current, which is bad. Also, after plugging in all main battery leads in parallel to each other, it is best to let the batteries’ voltage equalize for a few minutes before plugging in the balance leads in parallel and beginning the charge. 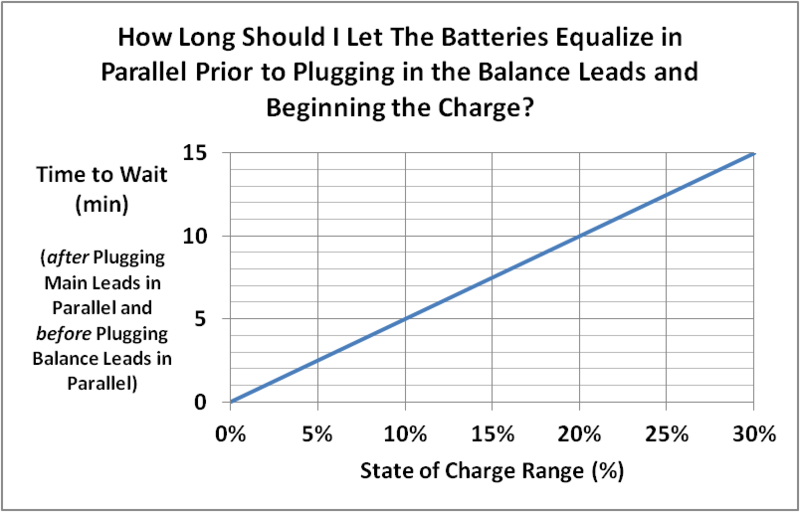 The chart below is just a rough estimate of how much time is recommended to let the batteries equalize their voltages prior to plugging in their balance leads and starting the charger. 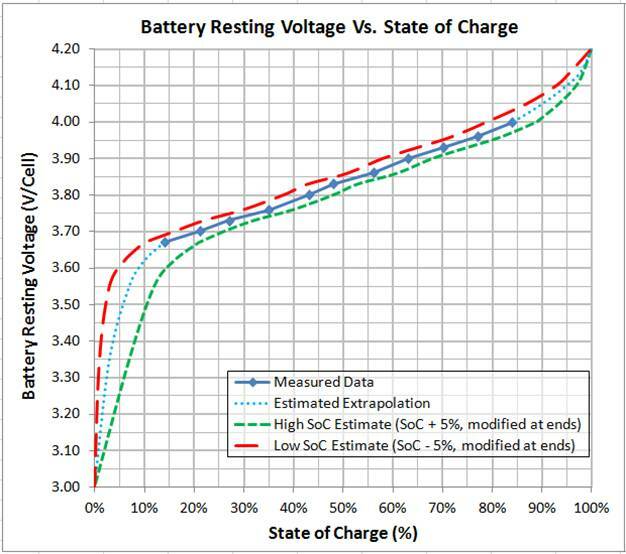 Note: State of charge range = most charged battery State of Charge – least charged battery state of charge. Ex: If the most full battery is at 50% and the least full battery is at 30%, the state of charge range is 50% - 30% = 20%. See my extensive article I wrote, titled “The Details of Electric Radio Controlled Aircraft,” under the “Battery” section of the document (approximately pgs. 22-35), found at my other website here: https://sites.google.com/site/electricrcaircraftguru/. Above comment was spam, and hence removed. Thanks for all the great info, I will be using this info shortly to start parallel charging batteries for my new flight school. Hey, great guide! I was at one of the sites you provide link to and i read this: "There is no need to match the capacity, C-rating, age or brand for parallel charging. For example you can charge a 3s 2200mAh 15C lipo, a 3s 3200mAh 25C lipo and a 3s 850mAh 35C lipo together". So it looks like i can charge different capacities. I have 3x 5500mAh 3S and 4x 1200mAh 3S. Do you think i can charge them together? Short answer: yes, charge them all together. As long as they are at similar states of charge/discharge (ie: at similar voltage levels), you should be fine. Longer answer: be a touch more cautious with ensuring they are at similar charge/discharge states before you plug them in parallel together, and make sure to wait plenty of time for them to equalize their voltages before beginning the charge. Something to be aware of is that if the smaller batteries are at a significantly lower voltage than the larger batteries, they could receive a substantial current for a long enough time to possibly damage them. This is because larger batteries will be able to provide a current to smaller batteries for a longer time period than smaller batteries could provide that current. Additionally, larger capacity batteries have a lower internal resistance than smaller capacity batteries, so they can deliver higher currents. This applies to plugging them in parallel. Ex: A 5500mAh 3S Lipo at 3.7V/cell, for example, will push a higher current, for a longer time period, into a 1200mAh 3S Lipo at 3.6V/cell than will a 1200mAh 3S Lipo at 3.7V/cell push into a 1200mAh 3S Lipo at 3.6V/cell. Make sense? Anyway, plug in a power meter between the parallel charge board and the lowest-charged battery to see how current flows into it as you plug in the other batteries to the parallel charge board. This will give you a lot of clarity and insight into what's really going on. One more point of clarity: 2 things actually will decrease the internal resistance of a battery: 1) Size (Capacity [mAh]) and 2) C-rating. The higher the capacity (mAh) of a battery, the lower the internal resistance. Also, the higher the C-rating, the lower the internal resistance. And....the lower the internal resistance, the higher the current the battery can deliver. Let's make that 3 things: one more came to me that I had forgotten to mention: 3) Temperature. A warm battery has a lower internal resistance. Ex: flying in the Summer, when my battery starts out fully charged and is 80 deg F, my NutBall (see http://electricrcaircraftguru.blogspot.com/2013/02/this-is-what-my-nutball-can-do.html) pulls about 27A peak, but in the Winter, when the battery starts out at ~30 deg F, the motor might only be able to get ~22A peak or so. As the battery warms up in flight, the current may increase a little as the internal resistance decreases, but it will not deliver as much power as it will in the summer. Is it possible to charge 3 3.7 1s batteries if you wire each JST connector to a different lead on the jst-xh for a 3 cell charger and all the commons together. Does each lead put out 3.7 volt? Ok, now, what you want to do is definitely possible. What you are describing is called "Serial charging." Google it. To wire 3 1S Lipos in Serial, wire the - on one LiPo to the + on another, and that + to the - on the next one, and that - to the + on the next one, etc., as my diagram shows. Make sure to use 3 1S batteries of the same capacity (or one of the 1S batteries will fill up way before the others) and similar discharge state (again, for same reason as before). Also, make sure to use a BALANCE Charger and do a BALANCE Charge. 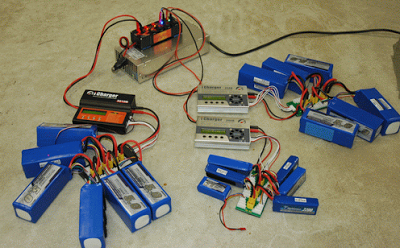 For 3 1S Lipos in series, charge them as a 3S LiPo at a rate equal to the Capacity of one of the batteries alone. Ex: Serial charging 3 120 mAh 1S Lipos in series means you should charge them as a 3S (11.1V) 120 mAh pack, or in other words, choose the 3S (11.1V) charge setting at a rate of ~0.1A. If you serial charge a 120mAh pack with a 350mAh pack and a 500mAh pack, all in series (not recommended, but possible on some chargers with sufficient balance node discharge current capability), again, remember to choose the 3S (11.1V) charge setting, but charge at the lower rate of 0.1A (corresponding to the 120mAh LiPo), NOT the higher rate of 0.5A (corresponding to the 500mAh LiPo). For Parallel Charging, you MUST use same cell-count (Voltage) batteries, but capacity doesn't matter. For charging, add the capacities together and use the cell-count of any one of the batteries (since they are all the same cell-count). For Serial Charging, you REALLY SHOULD use same *capacity* (mAh) batteries, but cell-count (Voltage) doesn't matter. For charging, add the *cell counts* together and use the capacity of the lowest capacity battery (though they should all be the same capacity). FYI: if you are planning on using a cheap 3S LiPo balance charger to charge your tiny 1S Lipos (120mAh, for example), this is a bad idea, as the cheapo 3S charger will charge them at too high a rate, and damage them. If the batteries are ~800mAh or larger, however, they should be ok in such a charger.
. I do have one question for you concerning parallel charging. I have (4) 3S 3300 mAh batteries. My charger is a Thunder 0620AC (20amps-300watts). I set my charger for Lipo 3s at 13.2amps (4x3.3). After about 40mins, it will quit charging stating Termination due to Capacity cut-off. There is a setting in the charger for Capacity Cut-off which the default is 5000mAh. My question to you is, Since I’m charging (4) 3300mAh batteries in Parallel, the total mAh is 13200. Should I change the default on the charger to a value higher than 5000 when charging batteries in parallel. The charger works fine if I’m just charging (1) battery. I cannot find an online manual for this charger and the manual that comes with it is very vague. Yes, increase the capacity limit to ~1.1 x the total capacity of the parallel pack you are charging. So, for 4 3300mAh LiPos, that's 13200mAh (like you stated) x 1.1 = 14520mAh. If you can, set your charger to 14500mAh or so capacity limit. If it can't go that high (it may be limited by its firmware), just set it to the max setting, and you'll have to restart your charger every time it hits this limit and stops. The purpose of this "capacity limit" setting, by the way, is really just to be an additional safety feature to ensure that the batteries don't keep charging and charging and charging and possibly catch fire....which I suppose could happen in some really bizarre situation where the voltage detection circuit fails. Excellent article, thanks. I’m an RC old-timer (original Triton owner with NiCD and NiMh batteries) but getting into and learning LiPos now. Helping my brother with Traxxas EZ-Peak Plus 6amp LiPo Charger. Charger works great for charging single LiPo and balances each cell on the preferred Balance Charge. So then, he purchased a CommonSenseRC Paraboard PRBRD-TRX (looks similar to yours pictured above). When charging 2, we leave the Balanced Charge Program the same as charging a single 7.4v 2C 5800mah except we change it to 11,600mah. Again, it seems to work fine … but obviously, takes twice as long. Life is good, but here is my question. I understand how parallel boards are wired and why it works. The battery charger really just sees one large 7.4v 2C 11,600mah LiPo battery. But again, it only sees 2 cells and there are really 4-CELLS. Doesn’t that kind of defeat the whole purpose of a precise individual-cell Balanced Charge? I can see why it’s slightly better with 2cell batteries (and might be more of a benefit 3 or more cell LiPos) but even then, it’s treating two LiPos cells as one (that are just in different battery sets). Is my understanding of parallel charging correct? Are my concerns justified? Vince, it sounds like you're on the right track, but still missing a little bit in regards to what is going on in parallel charging, so I would say that yes you explained things correctly, except for the one thing I will address momentarily, and no, in regards to individual-cell balancing, your concerns are not justified. With cells in series, and no balance lead, your charger has no idea how much voltage is in an individual cell; it only knows the total voltage. If it reads 7.4V, that might be cell 1 with 4.2V and cell 2 with 3.2V, or it might be cell 1 with 3.7V and cell 2 with 3.7V, or it might be something else. Unless the charger connects to the balance lead, it just doesn't know. So, let's imagine it's the first case. You start charging, with cell 1 at 4.2V and cell 2 at 3.2V, and the charger says, "ok, I need to see 8.4V before I stop, so I've got a long ways to go," when in actuality it is going to overcharge cell 1 and possibly blow it up or catch it on fire, and definitely it is going to ruin or at least damage cell 1 at a bare minimum. That's where active balancing comes in. Cells in series must be *actively* balance by a smart charger, to get them to be equal. However, here's what you're missing still: cells in parallel do *not* need active balancing by a smart charger. Rather, they naturally, by the laws of physics, will perform passive balancing. Cells in parallel automatically, passively, due to voltage gradients (differences), self-balance until they are equal. If you take 2 individual LiPo cells, and place them in parallel, and wait long enough, no matter what voltages they *were*, they will equalize, automatically, to become *equal* voltages over time. One will discharge into the other, until they are equal. So, in your case of 2 7.4V LiPos, when you place the whole packs in parallel, and the balance leads in parallel too, cell 1 of pack 1 is placed in parallel with cell 1 of pack 2, so both cell 1's will automatically, by the laws of physics, passively balance until they are equal. Both cell 2's will also passively balance until they are equal, since cell 2 of pack 1 is also in parallel with cell 2 of pack 2. However, both cell 1s (as if a large single cell) are still in series with both cell 2s (as if a large single cell), so *active* balancing is still required here, to get the cells in *series* actively balanced, and that's where the smart charger does its job. Therefore, when charging in parallel, you are still getting all 4 cells to be balanced, just as if you were not charging in parallel. Remember to be careful about large voltage gradients (differences), however, as the passive balancing can be quite fierce (and potentially damaging or even dangerous), if cell voltage differences are too great before being placed in parallel--refer back to my article for warnings & recommendations on this. I hope this all makes sense, please do respond to let me know. Yes, this is what I was missing ... cells in parallel do *not* need active balancing by a smart charger. Rather, they naturally, by the laws of physics, will perform passive balancing. Cells in parallel automatically, passively, due to voltage gradients (differences), self-balance until they are equal. However, I guess we just have to assume it's happening, because there is no way to verify or control it. Also, wouldn't it be possible for Battery1-Cell1 to be 3.0v and Battery2-Cell1 to be 3.7v and the charger not even know it? It would read as 3.7v (? I think) and not charge (or not charge much) ... all the while Battery1-Cell2 is correctly charged to 3.7v and the pack is out-of-balance. "However, I guess we just have to assume it's happening, because there is no way to verify or control it." I don't like to assume, so nearly every time I parallel charge, I verify it's happening. I do this by putting a power meter in line between the two packs, so that it will measure the current from the high pack to the low pack. When the current is zero, the packs are equalized. When the current is high, I won't even start the charger. I monitor this to make sure the current is not high enough to damage the lower-charged pack. If Battery 1-cell 1 is 3.0V and batter2-cell 1 is 3.7V, the second you plug them in together, a volt-meter (or charger) will read their average, or 3.35V. Voltage is the electrical equivalent to "pressure." If pressure is escaping from a high-pressure tank (3.7V cell) to a lower pressure tank (3.0V cell), and you try to measure the pressure back from the two of them combined, you'll basically read the average of the two, even if they haven't equalized yet. Plus, the bulk of the equalization happens pretty quickly. Grab a power meter and try it. Also, grab a voltmeter and manually measure the some batteries alone, and immediately after you plug them in parallel, and it will give you a lot of insight as to what the voltmeter sees. Rig/solder up some special harnesses if necessary, and compare resting cell voltages to combined cell voltages too, immediately after plugging some cells in parallel. Is there a tutorial on this? Sounds like something you do before connecting to charger or balance board? Not familiar with "Power Meter". If using a multi-meter, what do you set it to and what is "in-line"? I'm familiar with parallel or series connections. And then wait up to 15 minutes before starting charge. Sound about right to follow all safety warnings and passive balance suggestions? Sorry, I don't have a tutorial on this yet. I should post a video sometime, as it could be very useful to show what I personally do. One simple technique is to get alligator clip probes for your multimeter (voltmeter). Then, measure and write down the resting voltages for two batteries, then hook your probes up to your balance board main leads, being careful not to let them touch together. Plug in your two main leads for your LiPos, into the parallel board, and watch what happens to the voltage on the voltmeter. It should show roughly the average of the two batteries's voltages, assuming they are equal capacities. -If using a multi-meter, keep in mind it is rated to 10A max usually. The nice thing about the watt/power meters above, is that many of them can go up to 100A. If using a multi-meter, move your probes to the proper holes: black to COM and red to A (Amps). Then, hook the multimeter in *series* with *one* of your LiPo's leads, to be in parallel with another lipo. Plug the second LiPo lead straight into the other lipo. Now, the multi-meter is in series with a single lead which connects two LiPos, while the two Lipos themselves are in parallel with each other. By "in line" I simply meant "in series." Also, the 15 min rule is a rough estimate, as there are *many* factors involved, but is at least a ball-park rule-of-thumb. Remember not to let your battery States of Charge (% full values) be more than ~25% apart, or else you risk damaging the lower-charged battery. As for your procedures, those are correct. I made a video. Not exactly the most exciting but it will do: How to Use a Power Meter to Safety put 10 x 3S LiPo Batteries in Parallel for Charging. I read your article about parallel charging and have a question? I am ordered an ISDT T8 charger and parallel board. I mostly use 3S2200 mAh packs. My problem is how do I determine my powersupply? Rule of thumb: choose your power supply to be able to provide at least 30% (the more the better) more power than the power rating of the charger. It's that simple. If your charger is limited to 500W, for instance, choose a power supply that is 500x1.3 = 650W. This will keep your power supply from overheating even while your charger is pulling everything it's got (500W in this case), and a smart charger will automatically limit itself via its built-in micro-processor and C code-based firmware to keep itself from pulling more than 500W while charging, regardless of what the batteries want. Make sense? A quick google search of your charger seems to indicate it is a 1000W charger, so I'd recommend 1300W or more. Now, of course there are some caveats. As always, knowledge is power. If you know what you are doing, you can run your charger on a 500W power supply, or even a 100W or 50W power supply. How? Answer: have the *knowledge* to never set your charger to use more than ~70% or so of the power supply's max power. Remember that Power = Voltage x Current, or in units: Watts = Volts x Amps. So if you are charging a 3S LiPo and have a 100W charger, then I'd recommend pulling 70W or less. A 3S LiPo is full at 12.6V, so what's the max current setting we should use? Answer: 70W / 12.6V = 5.6A. Stay below that and you're fine for this setup. Make sense? Use your equipment within its limits and you'll be ok. The basic equations you need are Ohm's Law and the power equation. V = I x R. P = I x V = I^2 x R = V^2 / R.